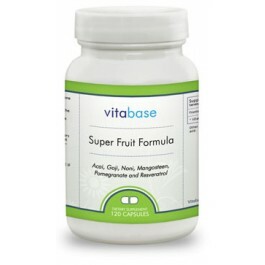 Experience the synergistic effects of five super fruits (mangosteen, acai, pomegranate, noni, and goji) plus resveratrol. Loaded with antioxidants that support a stronger immune system. Save hundreds of dollars over buying individual fruit supplements. See cost comparison here. Also includes proprietary fruit blend from raspberries, wild cherry, blueberry, elderberry and grapeseed extract. Get additional discounts by choosing one of our specials combos. 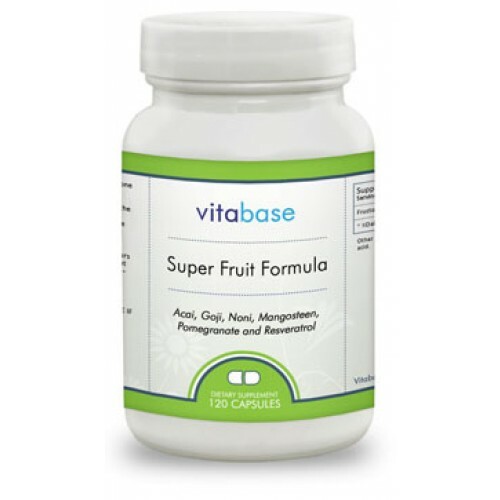 Vitabase Super Fruit Formula is founded on the principle that the best way to get antioxidants is from many different sources. Experience the synergistic effects of five super fruits (mangosteen, acai, pomegranate, noni, goji) plus resveratrol. These ingredients work together to support energy levels and strengthen the immune system. Buying these ingredients in one convenient formula is a great way to save money over buying the individual ingredients. Pregnant or nursing mothers, children under 18 and individuals with a known medical condition should consult a physician before using this or any dietary supplement.